Music has always been a huge part of my life because of the emotional pull it has. Like a time machine, a song can pull us back to that special moment in our lives when we heard it playing. Music expresses what we often fail to put into a words; our deepest raw emotions. Music can also be our friend to get us through rough times or to inspire us to do great, and sometimes not so great, things. Music made me name my youngest daughter, Rose for the song made famous by Bette Midler. Music made Rose and I get the word "Imagine" tattooed on our wrists for the John Lennon song, and as a reminder of all the great possibilities our future holds if we can only imagine. Music also made us take a trip to Central Park in NYC to visit the John Lennon Memorial together. We made the trip to celebrate. You see, Rose struggled with depression after being bullied. Getting through school was a battle for her, but she graduated High School, and it was the promise of the NYC trip that helped motivate her. She made it through a tough time and deserved to celebrate, so we went to NYC, and to Strawberry Fields. It is a memory of a special time shared with my daughter because Music Made Me Do It. Now, I want to know what moments of yours are made special because of music! Just by sharing your story you'll be entered to win a Punk speaker by Sol Republic and Tracks headphones by Sol Republic. To enter comment below with your music made me do it moment or share a story on Social Media (Facebook, Twitter, Instagram, etc...) using #MMDI . Then complete the Rafflecopter form below to complete your entry. 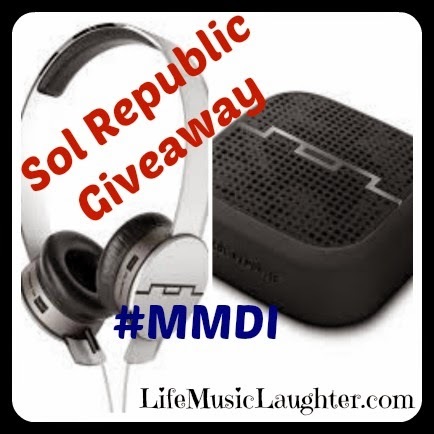 1 person will win both the Punk and the Tracks by Sol Republic. Open to U.S. and CA. I'm usually quite shy but music brings me out of my shell. When I go out dancing I sing along and dance like I'm all alone. I'm the same way. I can't help but dance when I hear a good song, and it doesn't matter to me if anyone wants to dance along. Good luck to you! There is not one day that goes by without me listening to Music. Music made me understand my emotions better than I could explain through words. Music made me have the ability to smile when I know I should be crying. Music made me silence the world, escape the state of depression and lick old wounds of the past. Truth be told, Music made me who I am today. Absolutely beautiful! Thanks so much for sharing. Good luck! My #MMDI moment is when I clean the house or work outside. When I listen to music the job gets down quicker and doesn't seem much like a job. I competely agree! Music makes it so much more fun! Good luck! That's awesome! Lovin' music and gettin' fit! Good luck! I have some Sol Republic headphones and I love them. They are the best ones I've ever owned. I listen to music all the time. It just makes everything better. Those headphones sound really great! I need to get these for my son! Music is my life. There is not one day that goes by that I don't listen to music. Music is my fitness motivation. Music is many times my writing motivation. I dance every day. Glad to have come across your blog today. I think it's really cute that your daughter and you have matching "Imagine" tattoos. Music is such an important part of my life, and is always on in my house and car. Will have to check out these headphones. What an awesome giveaway! I think the PUNK Wireless Speaker would make a great gift for my husband since I know he's been looking around for a wireless speaker. I love hearing about how Music helped your girl with being bullied and depression- the same for my girl! Music helped her get through the darkest times! Music is awesome. That is all! I find music to be a great way to get someone out of their shell! When I meet someone I can talk to about music, I instantly find more interest in them! Thanks for sharing such a great giveaway. My teens would love it if I won this! Music is an incredible thing- it makes a bad mood bearable and a good mood even more enjoyable. Music always makes me just makes me want to dance. It can also help lighten my mood when I am down. I love music and so does my toddler. We always have to have the radio on in the car because it does move us. Lightens the mood too. Music made me fall in love with my husband all over again! I love music! I don't listen to a ton of music, but I love it when I'm driving, cleaning or working on a big project. It's motivating! Music made me fall in love with my husband! He's a musician and we met at one of his shows! What a great giveaway! That would be a great gift for my husband for Christmas! My #MMDI moment is on my way to pick up my son from practice. I always turn the music up loud and sing my heart out during my alone time. My #MMDI moment is when my husband and 3 year old daughter crank up the music and have a "dance party" together. She gets us hats and we all dance and sing together in the living room!